We have used this technique to evaluate our annual conference. The writing marathon helped our participants to surface what they had been reflecting on during the conference. It also helped us share deeper thoughts with our colleagues – by doing this, it sparked more vulnerable conversations within our team. This is a flexible technique. 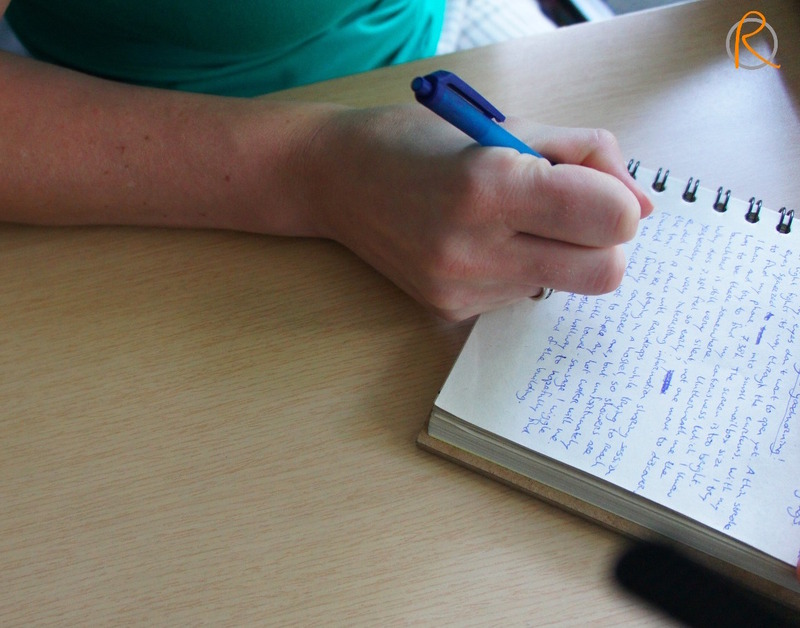 Depending on what you decide to write on, this technique will help you surface genuine reflections about a specific topic. This writing technique helps to develop greater awareness of our thought processes, and to enter a space of introspection. Writing is a great exercise to practice raw honesty. Community life can be transformed by the courage it takes to connect with ourselves and others more profoundly. Data collection, evaluation, community building, data analysis, research communication. Pen, paper, and lots of water. That’s it. Get your marathon runners together. You can do this exercise with your colleagues, with your family, or with a group of strangers. This technique works with a group as small as two and as big as 100. Before the marathon, it is a good idea to announce the time and date of the marathon in advance – to make sure people are in the mood. On the day of the marathon. If the group does not know each other, it is a good idea to do some community building and icebreaking before you start with the marathon. This exercise might work better with a group of people already comfortable with each other, as people might feel permission to be vulnerable. Introduce the marathon. You can explain this is an exercise of self- introspection and, if you are working a theme in particular, specify the topic you will be exploring with the writing. You can design the marathon around a word or theme. For example: teamwork, home, community, a specific program you want to evaluate, etc. Explain the objective of the exercise – e.g. we are doing the exercise to reflect on a specific issue, to encourage self reflection as part of our group process, etc. Make sure to stress that the exercise is not about being a great writer or poet. Instead, the goal is to use writing to let go, to end up in places that you weren’t expecting – to get to know yourself. Start by dividing people in pairs or groups of 3. Give few minutes for people to introduce each other, and share how they are feeling about the exercise. Explain how many round will be part of the marathon. You can make the process longer or shorter, depending on the mood and interest of the participants. You can make all rounds about a specific theme, or choose complementary themes/questions for each round. Make an announcement when 1 minute is left, so that participants can wrap up their thoughts. Encourage people to share in pair. If someone does not feel comfortable sharing their writing, they are welcome to just share the experience of writing: was it frustrating? Was it easy? Continue with the other rounds. Do you have suggestions to improve the marathon? If you are exploring a specific topic, ask more specific questions, and take notes. You might end the exercise here. If you’d like to deepen the process, you might ask people to transform their personal writing into a collective piece. Ask group to take few minutes to share their experience writing. Give the challenge to come up with a collective piece to share their reflection. You can provide the group with a list of options on format they might use while writing. For example: photo essay, poem, video. Give the group 1 hour to put together their piece. Share the piece with the other groups. This is an exercise to reflect and explore ourselves. The second part of the exercise can help participants share experiences, build empathy, and discuss a specific theme. This exercise will not work with an illiterate group – make sure you are aware of the level of easiness participants have with writing prior to the workshop. If someone is more comfortable writing in a different language, encourage that! This is all about self-expression and inner-exploration. Write in a language close to your heart. Exciting and powerful methodology that allows participants to reflect and bring to surface pertinent issues in their lives and their collective. I highly recommend it for community, association or organisational annual forecasting or visioning. me pareció interesante ya que se puede desarrollar de diversas maneras. es un instrumento que puede desarrollar diversas herramientas para organizar ideas. gracias por compartirlo.